Installation is easy. 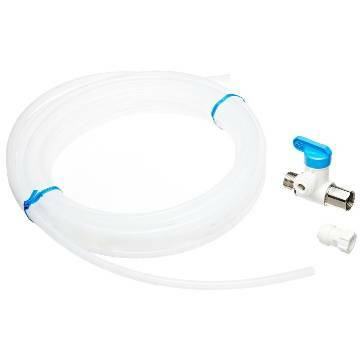 Disconnect the kitchen faucet cold water adapter from cold water inlet valve. Attach the Angle Stop Valve to the cold water inlet and connect the faucet line to the other end. Push the 1/4" hose in the kit into the Push-Fit Connector. Attach the Refrigerator adapter and connect the hose.